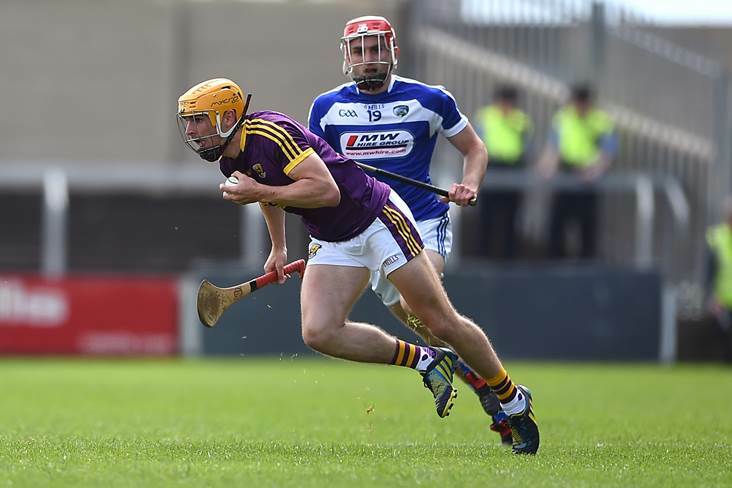 Wexford's Eanna Martin with Jack Kelly of Laois during their side's Leinster SHC quarter-final clash at O'Moore Park, Portlaoise. Wexford's new commercial manager Eanna Martin is committed to maximising the county's earning potential. Martin, who is a member of Davy Fitzgerald's senior hurling panel, was appointed to the newly-created role last month. Dublin are the only other county to have a commercial manager in veteran St. Vincent's sharpshooter Tomás Quinn, who is responsible for developing and delivering on sponsor relationships, and the overall commercial development of the Dublin brand. Wexford GAA recently had a successful fundraising trip to New York and will hold a Race Day in Punchestown on April 28. "There are plans for a corporate events area at Wexford Park," Martin revealed in an interview with RTÉ. "The new format in the Leinster championship is great because it means we have home games against Galway and Dublin. There's a big population in the county and the people are sports mad - they're only dying to get behind the teams. "We are still in the early stages with this. We are underperforming in a sense, but we really hope to start to see the fruits of our labour in 2019."